UML sequence diagram templates offer you many useful shapes. UML sequence diagram symbols like object lifeline, lifeline, activate, object, class, message, transition, note and more are available. Lifeline represents each instance in an interaction. Activate is used to denote participant activation. Once a participant is activated, its lifeline appears. Objects are model elements that represent instances of a class or of classes. 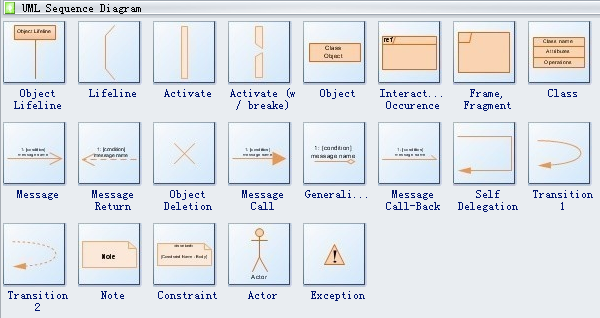 Classes in UML show architecture and features of the designed system. Message is an element that defines a specific kind of communication between instances in an interaction. Actor specifies a role played by a user or any other system that interacts with the subject. Note contains comments or textual information. Constraint is an extension mechanism that enables you to refine the semantics of a UML model element. Edraw software provides you lots of shapes used in UML sequence diagram. UML sequence diagram shapes like object lifeline, lifeline, activate, object, class, message, transition, note and more are available. Need fresh looking UML sequence diagram symbols for your design? These UML sequence diagram symbols are a cinch to pop in. And their crisp, fine detail will make spectacular, easy-to-understand diagrams and presentations to your customers.